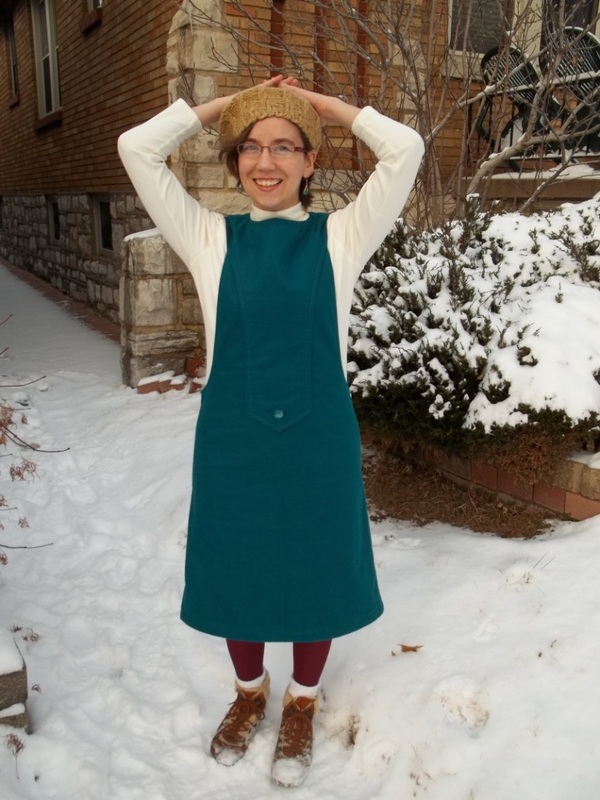 It’s been a few years since I made my first jumper – a vintage, warm and cozy fashionable (yet unusual) piece of clothing. As I don’t want my single jumper to get lonely in my closet, I made a second unusual and very fun vintage jumper to kick start my sewing for this year of 2015. Does it look like I love it? I do! It’s a little bit of mod and bold and uniquely complimentary all at the same time. Ah… most importantly it is warm and versatile winter wardrobe piece. Also, it was a stash busting project! I have to laugh, though, at the fact that my jumper is turquoise in color. Looking at the amount of projects that I make in this color, I guess some things don’t change in my sewing habits. FABRIC: I don’t really know, but at the same time, I do know. I’ll explain. This jumper’s fabric totally seems like a felt by its thickness and composition, but it also feels like a flannel by its softness and brushed pile. So, to explain, I’m rather confused, but I’ll call it a felted flannel (if there is such a thing). The content is probably cotton, but there might be some polyester or even acrylic in this fabric. This felted flannel is backed in a 100% polyester, cling-free, matching colored lining for a smooth feel and fine finish. NOTIONS: Everything but the zipper down the back and front button came from on hand. 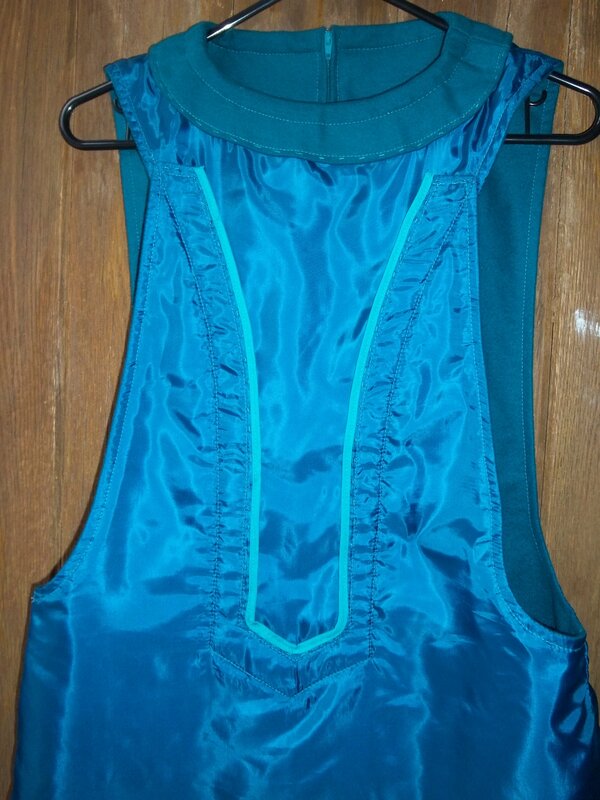 The zipper and button were bought from Hancock Fabrics, with the button being “fiber-optic” from their own “Lauren Hancock” brand. TIME TO COMPLETE: My jumper was made in no time – maybe 5 hours or less. It was finished on January 10, 2015. THE INSIDES: So professional and perfect, because of the very nice construction methods directed in the instructions. TOTAL COST: The felted flannel has been in my stash for as long as I remember, and the lining was bought a few years back, so I’m counting both as being free. All the expenses are from buying the zipper and the button, which is a total of $3.00 or less…cheap, huh?! Notice that this pattern is a “junior’s” sizing. 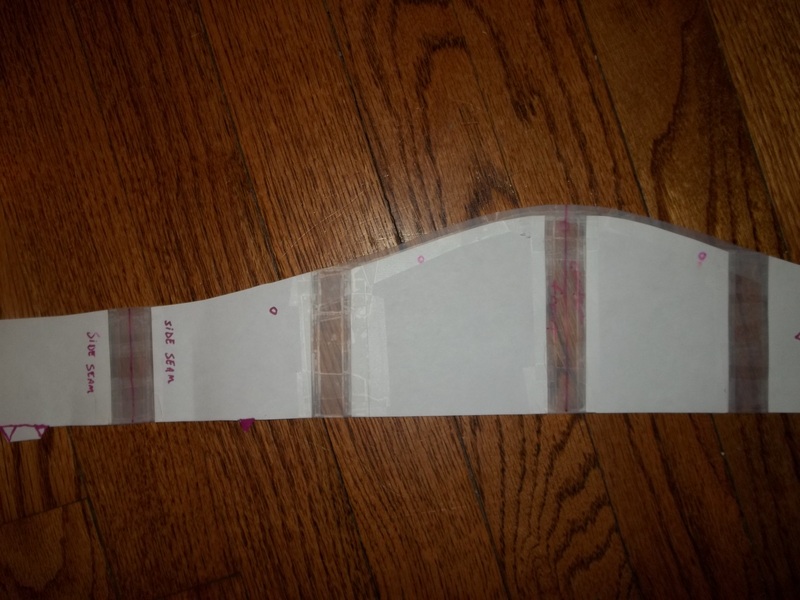 So I went back to the same method of adjusting the bust/waist/hip lines as for my last late 60’s junior’s pattern, which you can see by clicking here. For that first junior-sized dress, I added in 2 inches horizontally at the high chest (above the bust) to lower all the bust/waist/hips at the same time. After all, I measured and found out that the distance between the main sizing points is correct, just where those spots hit needed to be brought lower. That same adjustment was done to this jumper pattern and, again, the fit turned out perfectly. 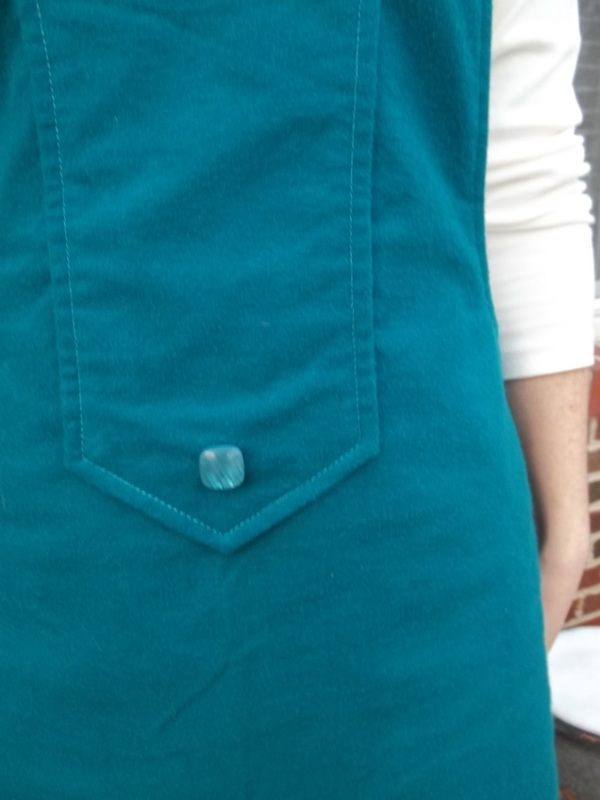 The dip of the side opening falls at my high hip, the bottom point of the front piece ends below my hip, and the decorative button becomes my “fake” belly button – all as the pattern shows. I know all this sounds strange, and maybe a bit weird, but, hey…the jumper is from the “Space Age” and I do say I like to try new and different things. 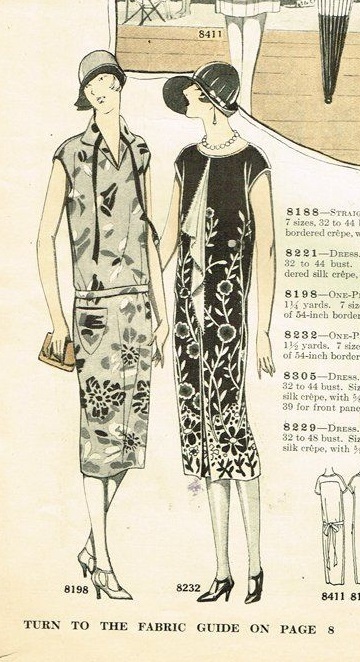 Speaking of “new and different”, this 60’s jumper pattern introduced me to a completely odd and never-heard-of-before sewing term for a specific part of clothing – “plastron”. 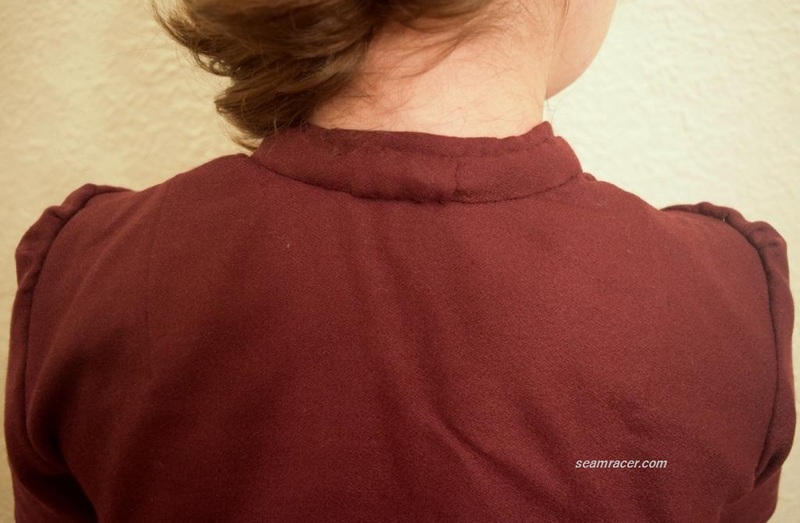 The back of the pattern envelope States that “the lined jumper with button trimmed plastron has slightly lowered round neckline, very low armholes, back zipper, and top-stitching.” Apparently the plastron is the downward arching piece which ends around my hip into a tri-pointed keyhole on the front of my jumper. Now, what exactly is the plastron? It does indeed sound like some sort of super cool science fiction space story word…sort of like the word “dalek” from the British television series Doctor Who. 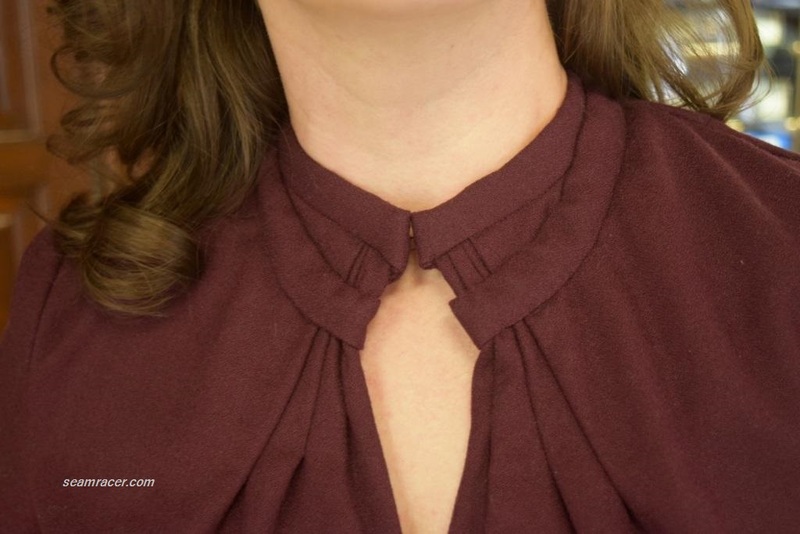 From the research I have made, a basic definition for a plastron is more or less and interfaced chest piece that fills the hollow between the shoulders and bust (based on “The A to Z of Sewing” by Janome/uk.com). 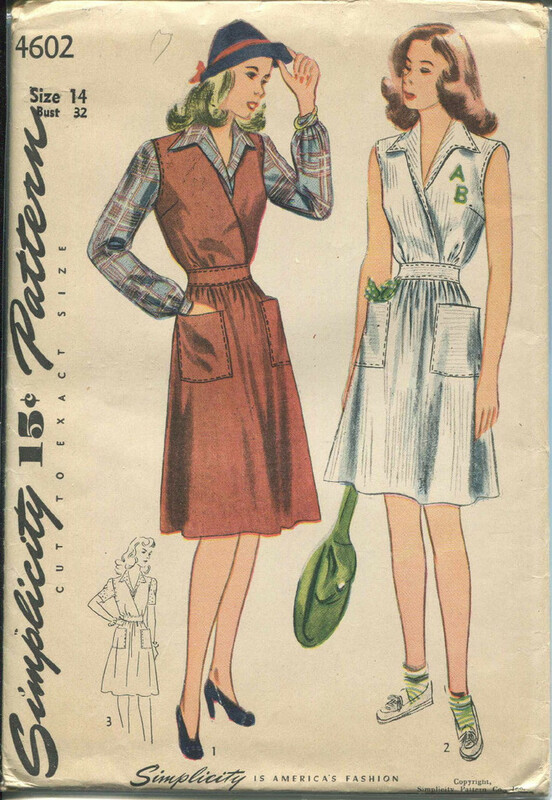 However, “Gertie’s Blog for Better Sewing” quotes a 1947 book- here –where a plastron is listed as a type of a yoke. A basic dictionary definition of plastron has several general terms showing how this article of clothing has been around since the middle ages when it was a front piece for armor, and later a defensive protection for the sport of fencing. The basic idea of a plastron, a separate piece of garment meant for covering the chest/shoulders, was incredibly popular in the 1830’s into 1860’s as well (see this wikipedia page). During those eras, it was popular for women to appear to have wide shoulders, and also use pieces which covered, protected, or fancied up their bodices with such plastron style pieces as a fichu, or a tippet , or a pelerine (see this Pinterest page for a picture of a pelerine). A pelerine appears to be the closest and oldest thing to what we know as a plastron, being that they both are made from the same fabric as the rest the garment, are trimmed and decorated, and have a high neck. 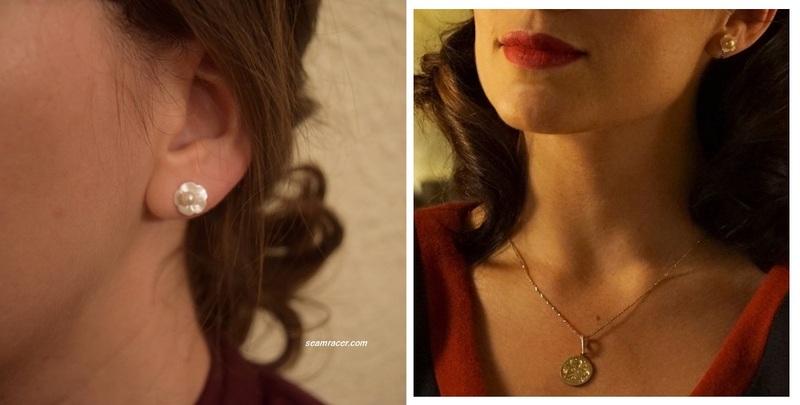 Now, both you and I can properly recognize a style that has been used for many centuries. 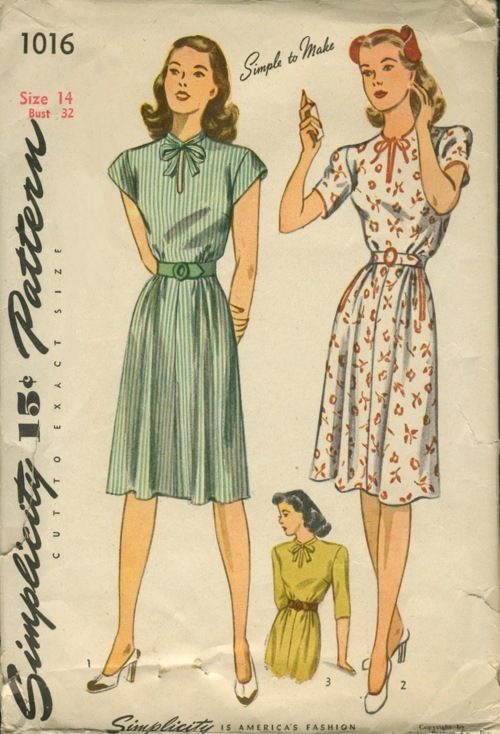 I have a 1940’s plastron dress to post about soon and a few 50’s plastron dress patterns I would like to find (such as the 1959 dress at right), so keep watching for this neat style across the decades! 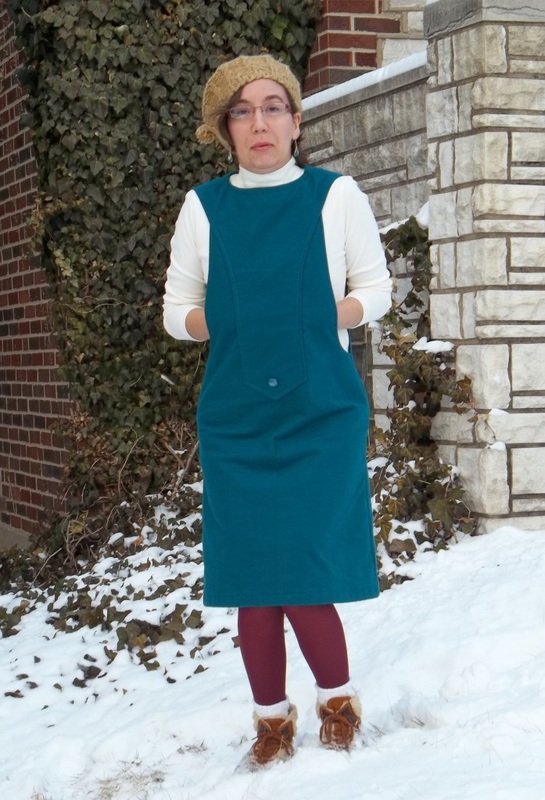 After my failure at attempting to make a funnel neck (back when I made this 1968 corduroy dress), I had little interest in making the pattern’s version with the high collared turtle neck. Although it does look neat on the cover drawing, in all reality I don’t think I could pull off the collared funnel neck view, styling wise. A turtleneck if definitely a necessary item of clothing to wear with this jumper, anyway, big funnel neck or not. 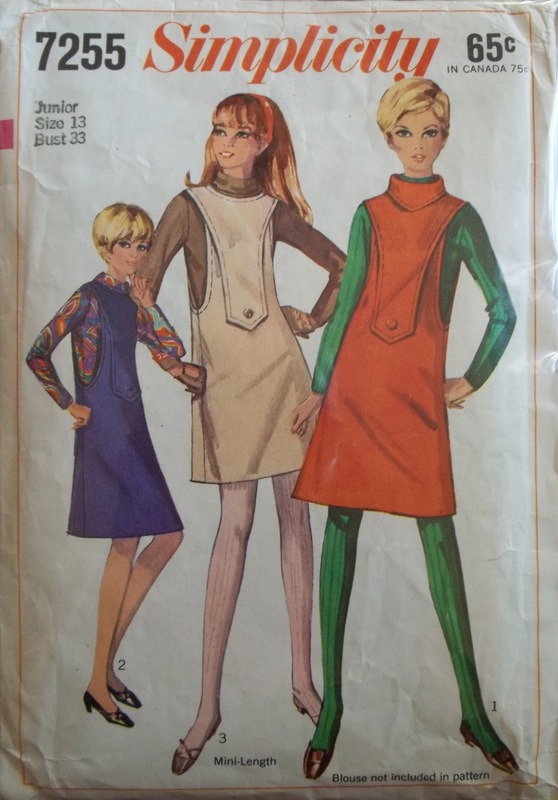 I have searched high and low with no luck at finding a wild colored paisley turtleneck like the one shown on the cover model at far left – but I do have another late 60’s pattern in my stash to make my own copy at some point. Anyway, let’s talk about being economical! Making this jumper using 60 inch width material took even less fabric than the amount listed on the back graph of the pattern envelope. That is always a nice surprise to be able to make something great on so little fabric. In total, I believe the jumper only used 1 1/3 yards. 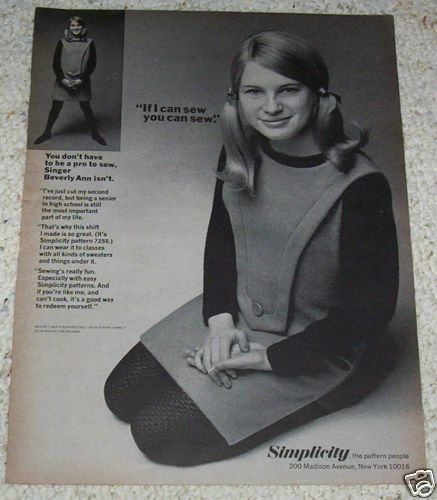 The suggested fabric types also leave this jumper to be made out of practically anything a seamstress might possibly have on hand: cottons, synthetic blends, denims, fleece, linen, double knits, woolens, gabardine, and corduroy. This is one sensible but strange pattern. The jumper itself went together in a flash, even with completely lining the insides and covering every seam. I found the pattern construction methods to be amazingly smart, and for once I followed the instructions almost 100% (only once in a blue moon do I do this). 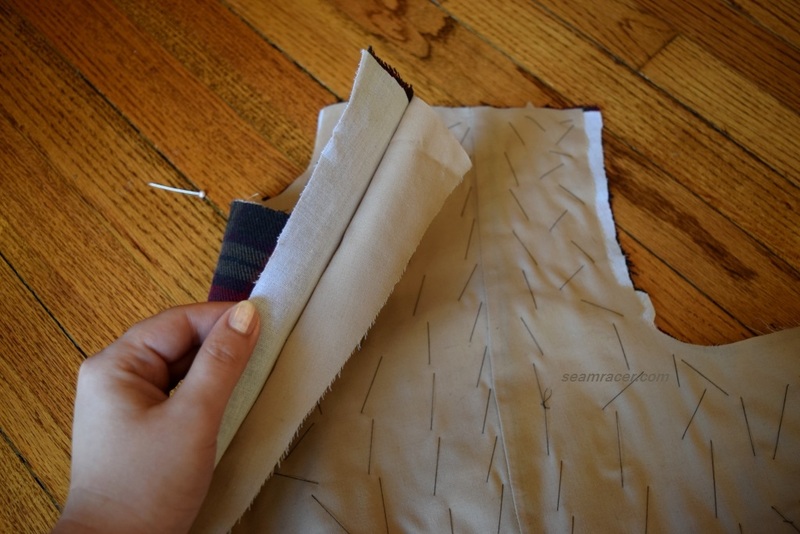 You sew up the back, connect it to the plastron at the shoulders, and also do the same for the lining. 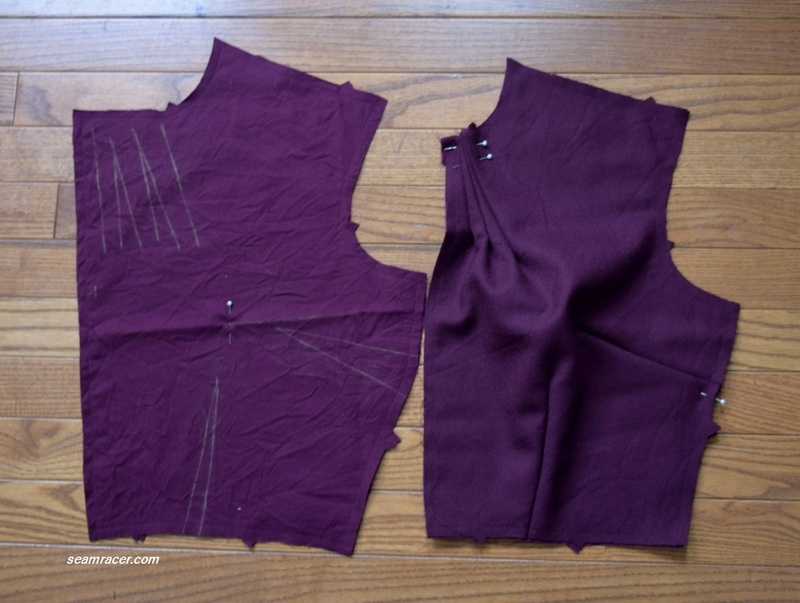 Then, you sew the lining (wrong sides out) to the jumper fabric all along the back half of the armhole and all the way down and around the plastron. Turn right sides out, top stitching completely around the edges except for a few inches away for the side seam edge. Now the zipper had to be installed so the neckline facing could be sewn on. Next, the bottom front of the jumper had the armhole edges finished off in the same way as the back/plastron piece, lining to fabric, wrong sides out, with right sides turned out and edges top stitched. I covered the inner raw edge of the bottom front with bias tape before lapping the plastron over the lower front to make one whole piece. To my happy surprise, the marks to match up the plastron on the lower front matched up so very perfectly, making things incredibly easy. Last but not least, the side seams were sewn up in one continuous line of fabric and lining so that the top stitching around the armhole bottom could be finished. The last decision on the hem finishing was difficult for me because I wasn’t quite sure what length to choose. On account of adding in the two inches to adapt in from a junior’s measurements to normal proportions, the bottom length came to fall a few inches below my knee. The jumper, from the hips down, fitted like a very nice, straight pencil skirt, and I felt the hem would look best quite short. Adding a little “hottie” factor would not be a bad thing, anyway. 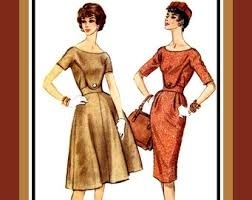 However, most people I know who lived the prime of their lives in the 60’s and 70’s seem to look back and cringe at the mini-mini lengths they wore for those decades…and I did not want to completely revisit those days. Thus, my jumper is shorter than what I am used to, but still long enough to be conservative. The lining is just an inch shorter than the jumper itself, and free hanging separately, attached at the side seams by thread chains. It is funny how just a little bit of different styling changes the theme of the jumper between blatantly junior’s into modern flashback retro. 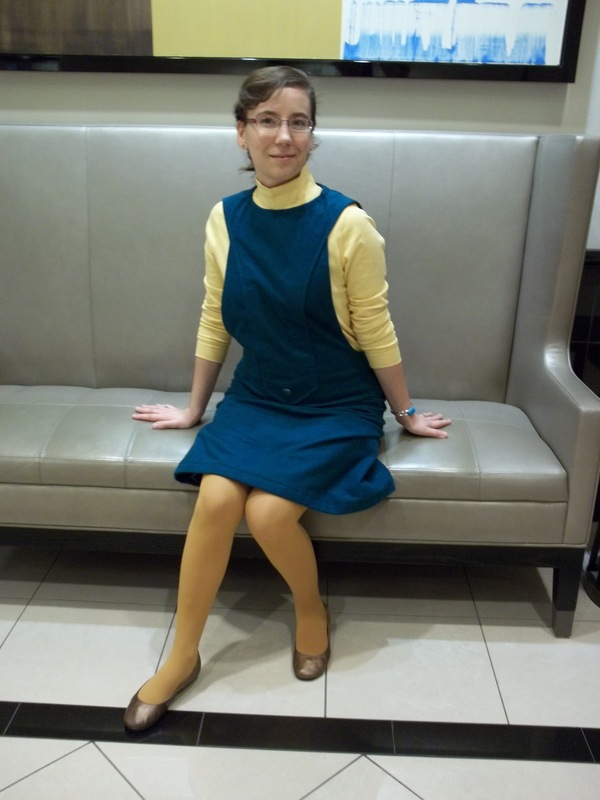 Knowing about the styles of the era and observing the pattern envelope, I enjoy pairing matching/contrasting colors of my turtleneck and the tights worn with my jumper. The different toned yellow colors as seen in these second pictures, together with my hair pulled straight back into a low messy bun and basic flat shoes, seems like the junior’s theme for the jumper. I don’t need any help looking younger than I am. So, to make an adult theme, I paired it with my knitted beret hat, a basic white mock-neck top, cranberry tights, chunky socks, and suede boots. This second modern adult theme is my favorite and warmest way to wear my jumper. The boots you see are Italian leather and were my mom’s boots, bought for some ski trips she took with my dad in 1979, so they are about a decade off in years from the era of my jumper, but they add a special fun and warm touch to my outfit. Even with being bundled up, I was quite cold in the picture at right and used my jumper as a sort of muff to warm up my hands. Look for more pictures of the different ways I use and wear my jumper loaded soon to my Flickr page. Creating a garment like my ’67 jumper highlights one of the best benefits to making one’s own clothes – you can try new and unusual styles, something you can’t find or get to wear otherwise. To me, making one’s own wardrobe is all about exploring one’s own tastes in style, attaining a fit uniquely one’s own, and finding enjoyment from being open to endless possibilities which come from fashion being in the hands of the individual. Being an individual keeps you from turning into a boring, uniformed robot, like so many who wear exactly what the advertising industry tells you is “the thing”. Sure, I keep up with trends, but just enough to know what’s going on and recognize quality or a vintage style feature when I see it. 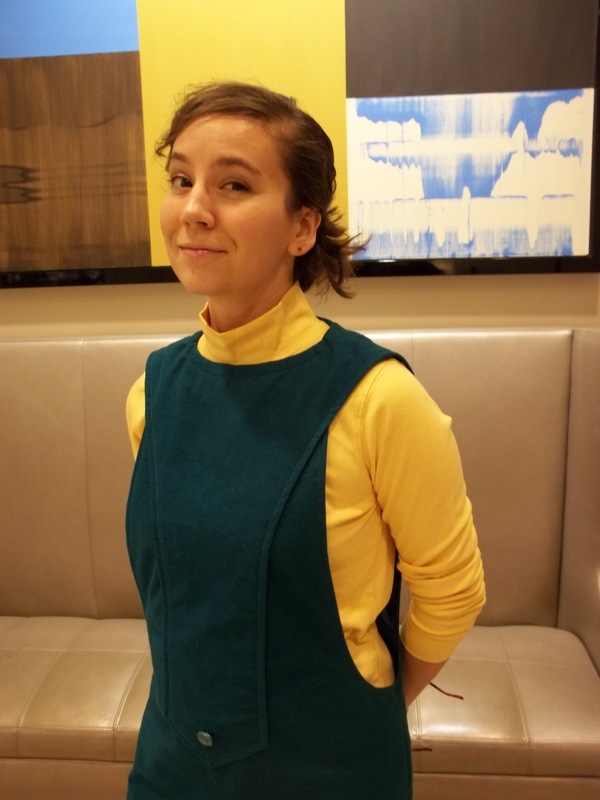 This 1967 jumper might be different…and I like it that way. Will you help me end the fast-fashion, advertising-brainwashing of our modern culture and make your own wardrobe, too? I have found that, for myself, once a weakness or fear is conquered in regards to a certain sewing skill, that it then becomes something very enjoyable to do. Such good feelings happen because I end up with more confidence towards something which had been a boundary. I don’t want any walls to hold me back from what is possible. 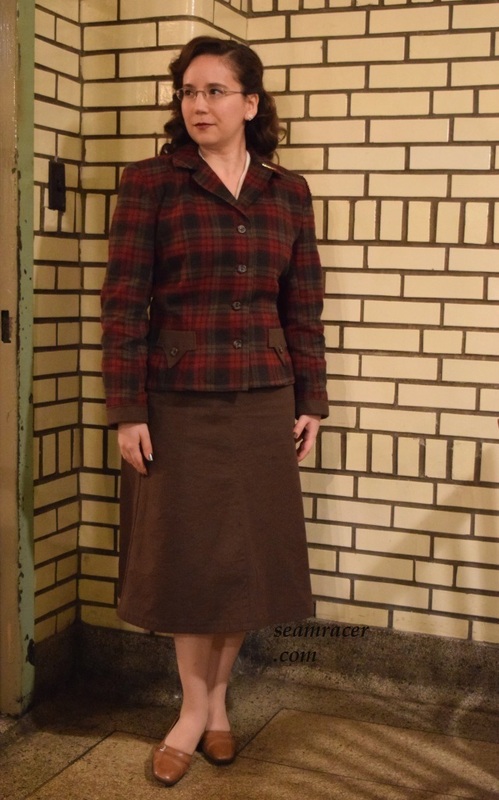 This plaid 40’s skirt falls into that rank of “confidence building projects”. 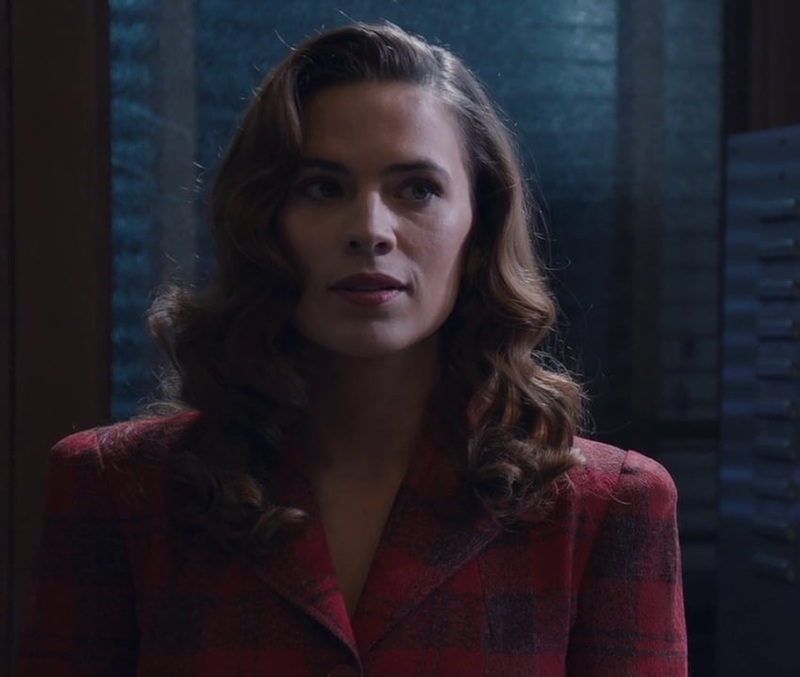 I wanted this to be a very casual, comfortable, unassuming wartime wardrobe staple – and my finished skirt most definitely fulfills all those wishes. 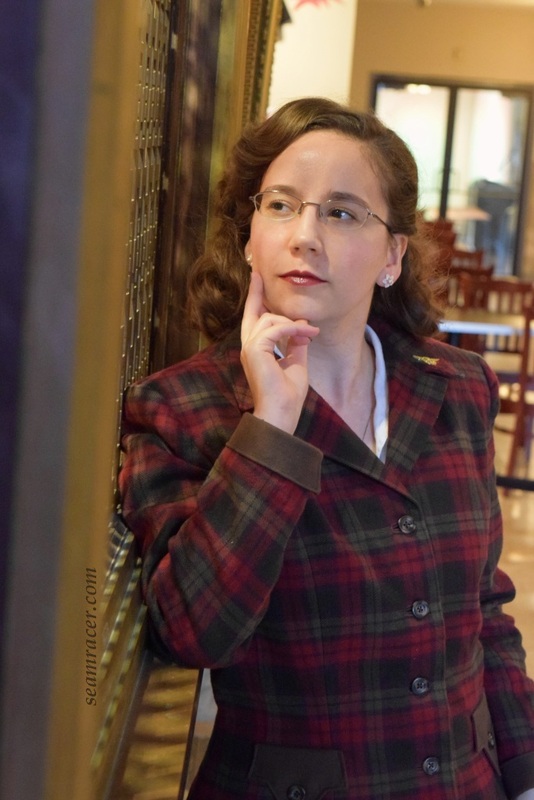 However, at the same time, I am hoping that my 1943 skirt has a special classiness that shows in the time and attention which I spent in meticulously matching all eight plaid panels. 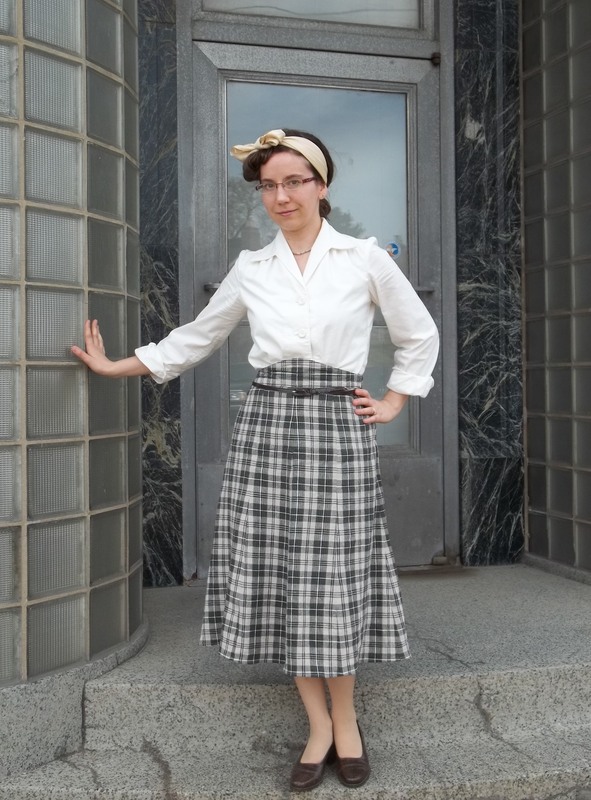 So many RTW (ready–to-wear) store clothes sadly lack precise matching of fabrics which are plaids or stripes, and I hope that a skirt like mine inspires others to see at least one obvious benefit to making clothes for oneself! 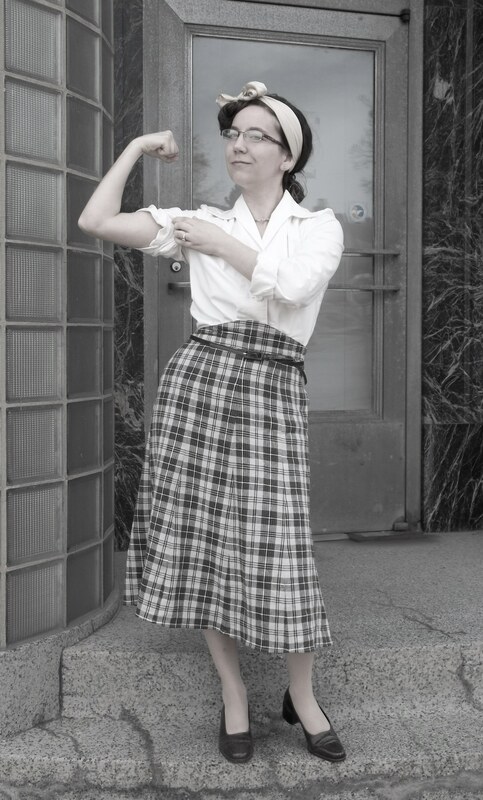 Here in the above picture, I am aiming for a “Bomb Girls” or a sort of “Rosie the Riveter” look, as if I just got off from ‘work’ at the late Art Deco style factory building where I’m posing. 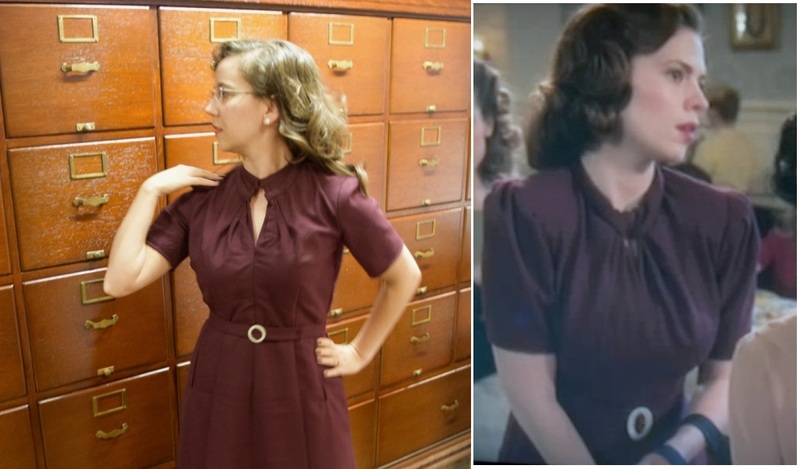 My blouse is also from a 1943 pattern, but it is a Simplicity #4602, (left picture) blogged about in a previous post (click here for link). The waist band is a wonderful and unique 40’s design. It was a bit more complicated to get it right than I realized, but it was still easy enough. There is a similar skirt worn by the actress Ginger Rogers in the 1940 movie “Lucky Partners”. Unlike my skirt, her look-alike skirt was part of a suit and in a solid color, but the high, curved waistband is the same. 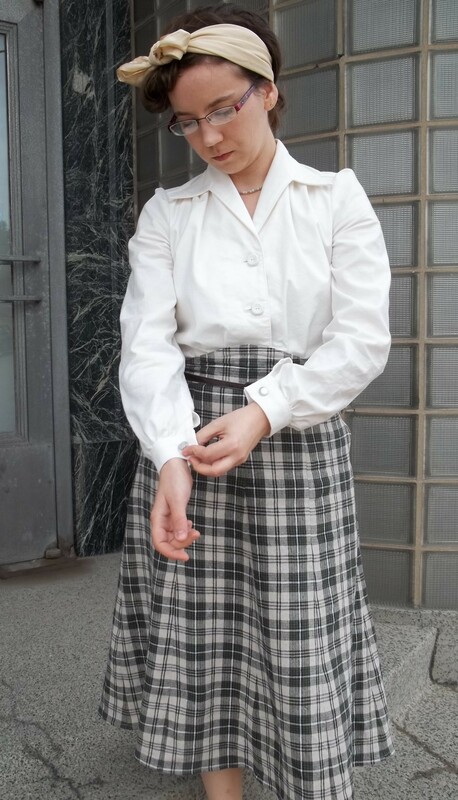 The pattern for my “workday” plaid skirt comes from a vintage Hollywood pattern which doesn’t have a famous actress or a movie directly associated with it, only the “four star” guarantee that it is a high fashion (for ’43) and quality design. 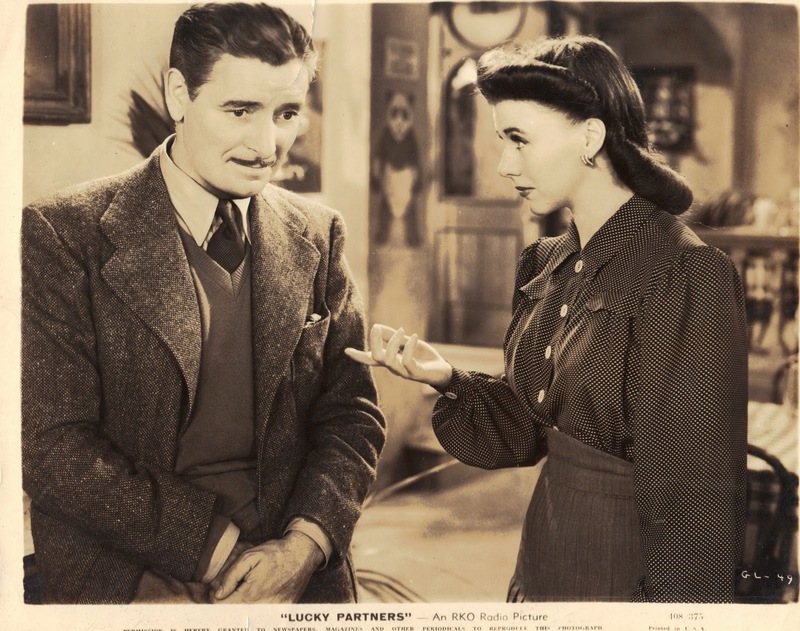 I would like to think I have found one source of design inspiration for the pattern used for my plaid skirt by finding the renowned Ginger Rogers wearing a similar style feature (see the scene in the right picture where she’s with actor Ronald Colman). FABRIC: The olive plaid fabric for my skirt has been in my stash for as long as I remember, so I am making a calculated guess as to what it is made of. I am almost 100% sure it is a rayon and linen blend, and it might even have cotton, but there is definitely no synthetics. 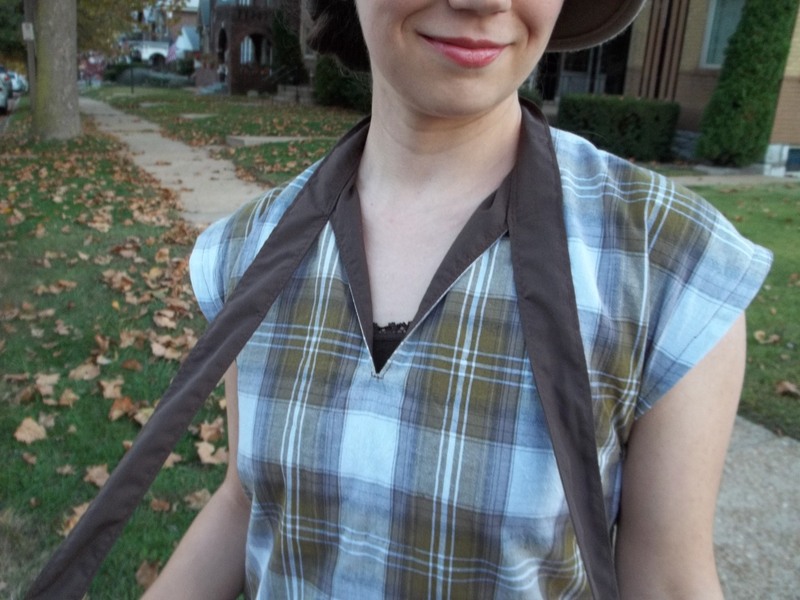 The plaid fabric’s raw and nubby hand, soft drape, and open weave characteristics are very similar to the fabric I used for my “Geometric Lines” 1920’s tunic top. However, my skirt doesn’t wrinkle as easily as the fabric for my 1920’s tunic, so I know there’s another unknown fiber in the content. Whatever my fabric is made of, it is very comfy and easy to wear, but wrinkles like crazy when it’s washed and looks like it got rolled in a ball when it’s dry. Ironing is a must! 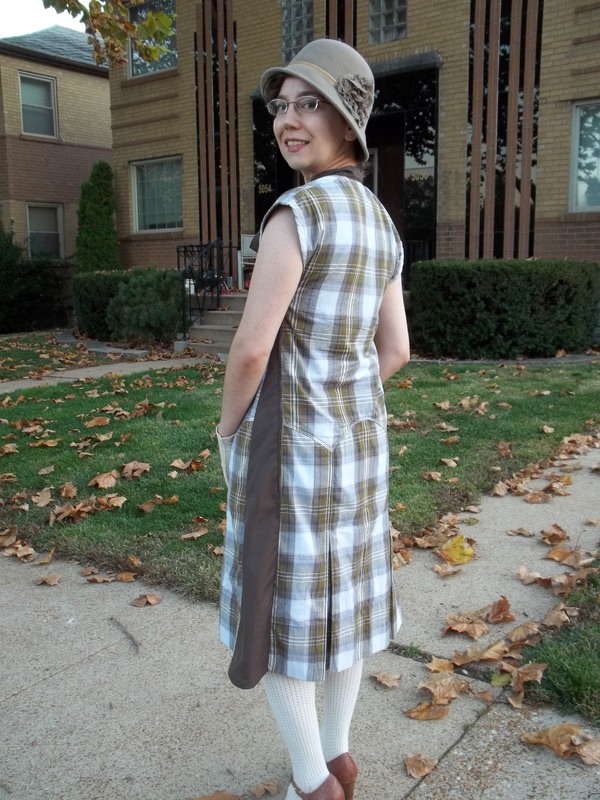 The skirt is lined in a beige/tan color polyester (I know, ‘modern’) cling-free lining, which came from my stash as well. NOTIONS: Besides buying a zipper for the side opening, I had everything else I needed on hand: thread, interfacing, waistband hook and eye. 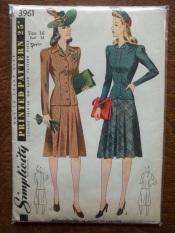 PATTERN: Hollywood #1117, year 1943. 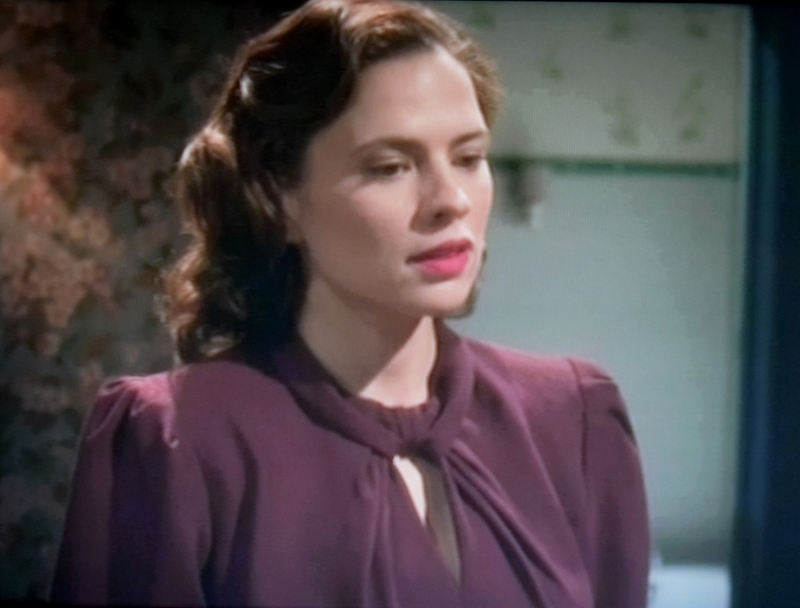 (I want to use this pattern to make the short sleeve ruffle blouse, too!) I used a modern, basic, two piece skirt for the lining. 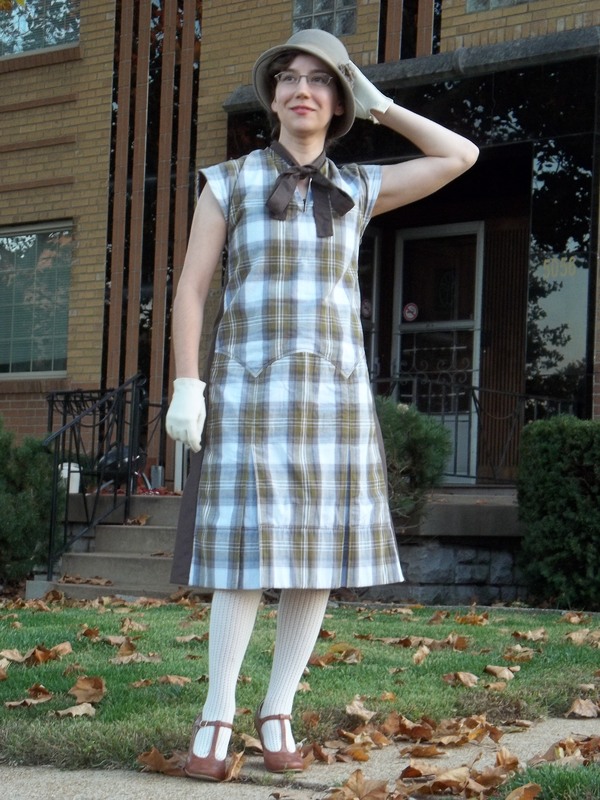 It was a pattern I have used before, Butterick 4522, year 2005. This skirt is cut on the bias so it would ‘move’ and flow well underneath. 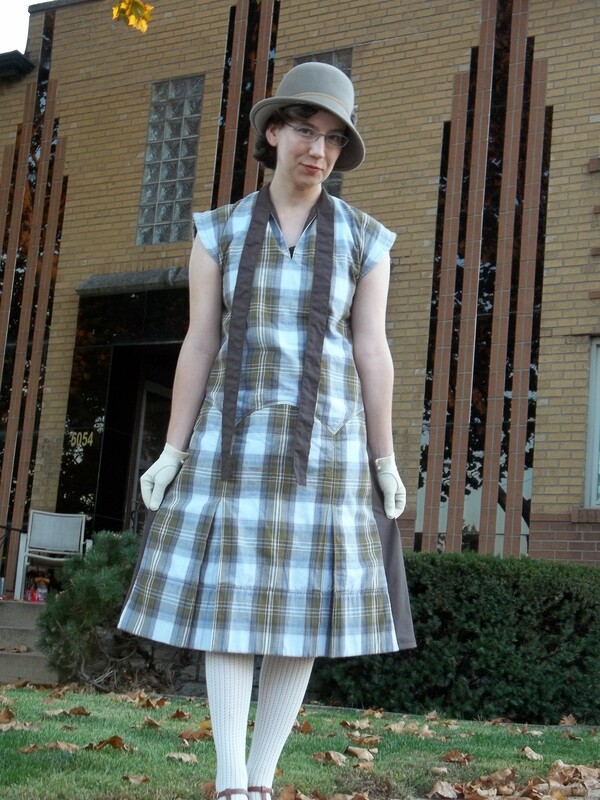 TIME TO COMPLETE: From start to finish, my plaid ’43 skirt took about 6 to 8 hours. It was finished on April 6, 2014. 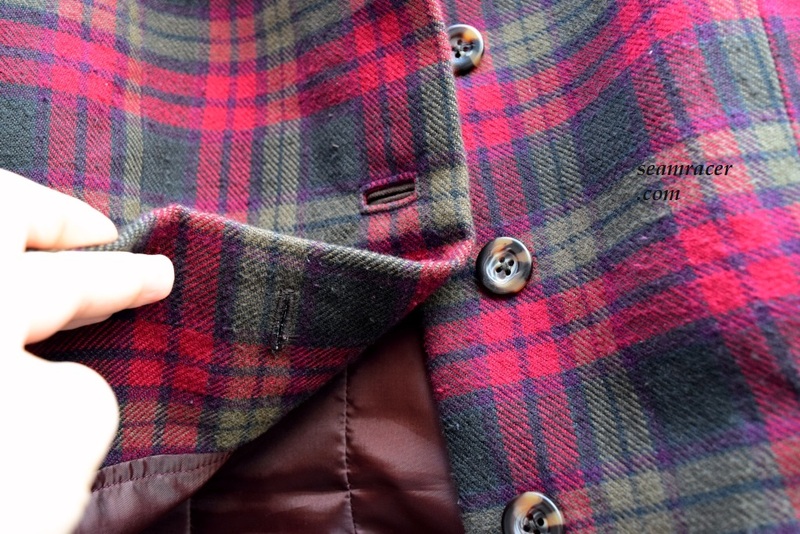 THE INSIDES: The raw edges are finished like they would’ve done it in the 40’s – just a simple zig zag stitch along the raw edges of both the lining and the plaid fabric. 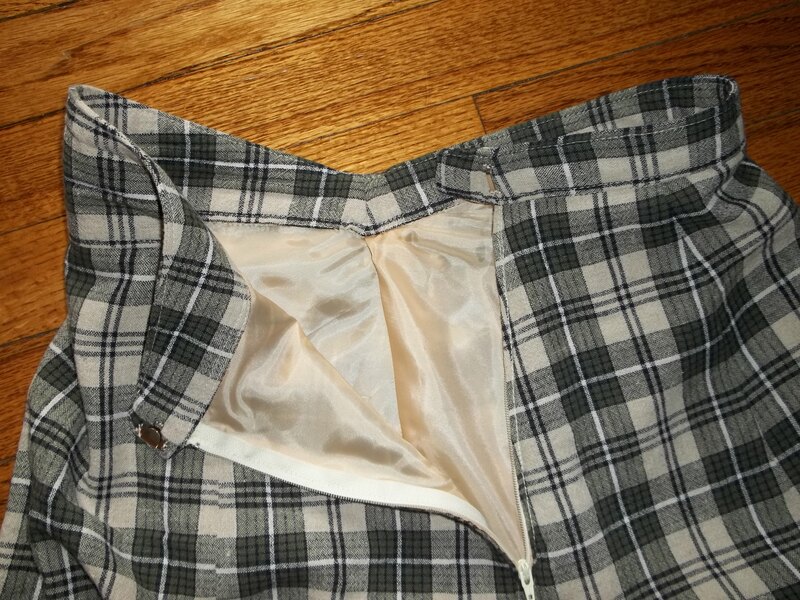 Self-fabric facing inside covers up the raw edges all along the waistband, while the lining covers up the inner seams to the plaid fabric. 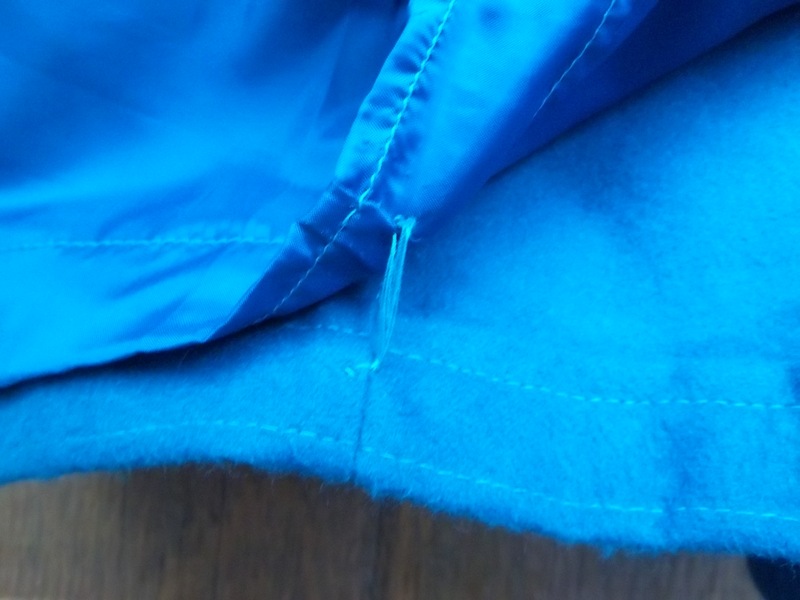 The side opening edges were turned in and sewn down to make a clean edge before the zipper went on (see picture). 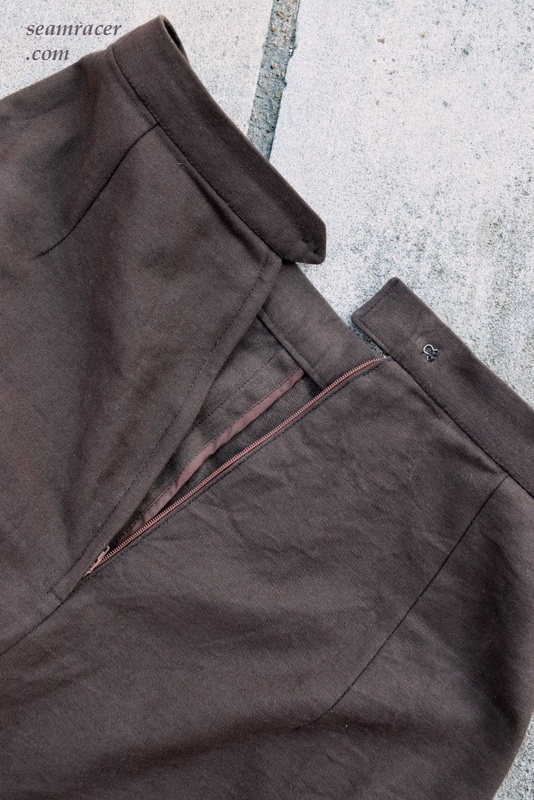 A large sliding style hook and eye holds down the waistband extension. 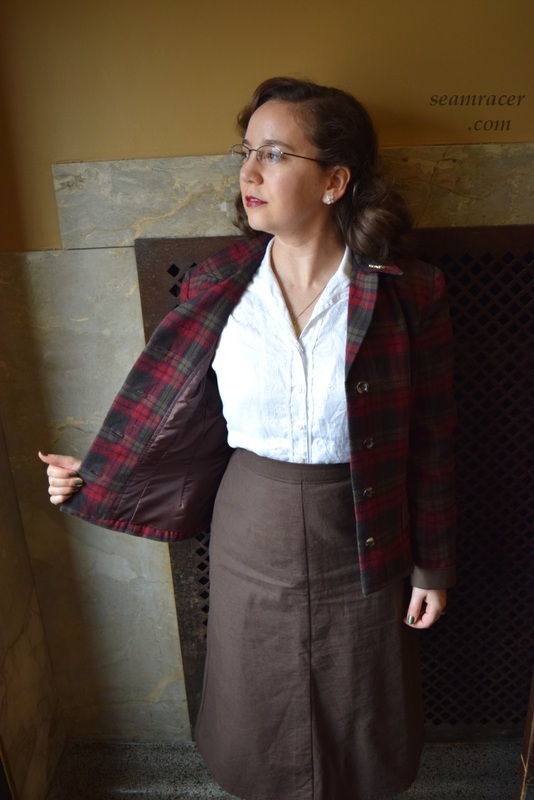 FIRST WORN: A vintage market fair was the first place I have worn this 1943 skirt. 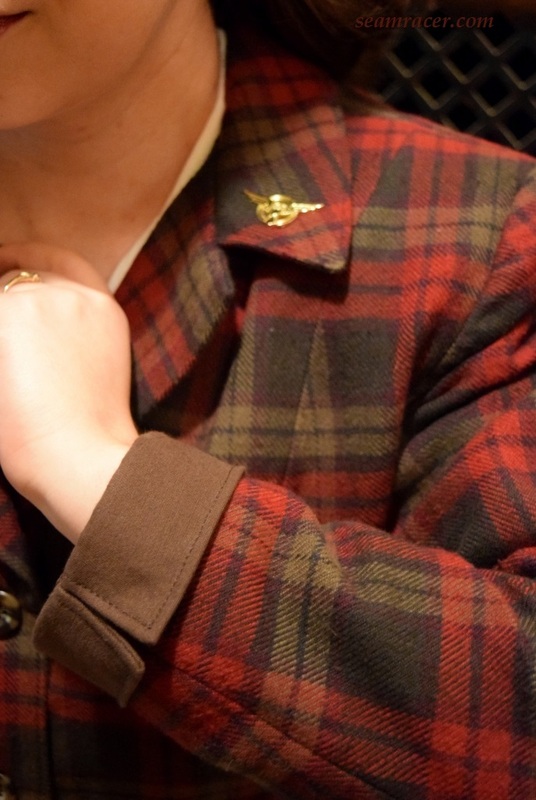 I wore it with the ’43 blouse, just as you see it paired in my pictures. 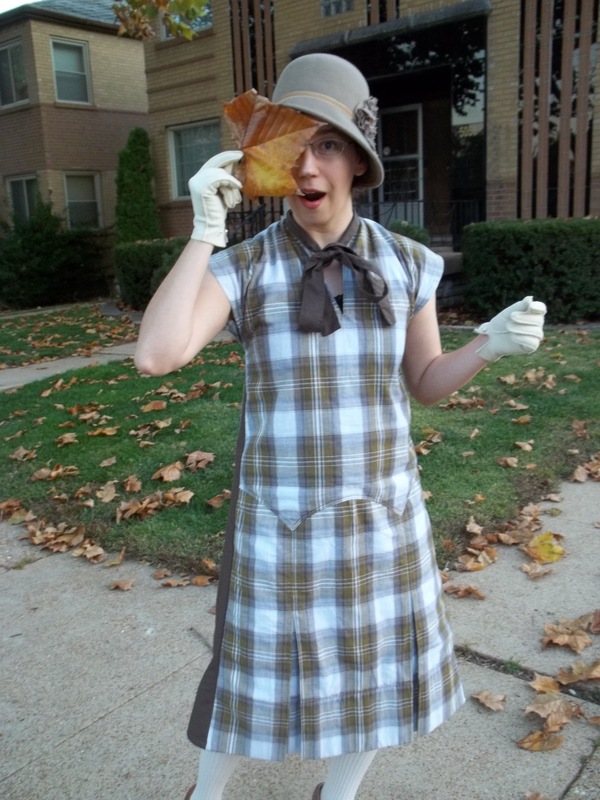 I got a number of compliments from vendors who seemed to appreciate the fact I was dressed in authentic vintage. TOTAL COST: The only money spent on my skirt was from buying the zipper, and everything else was completely from my stash. Thus the total cost is at $1.00. There’s 40s frugality! 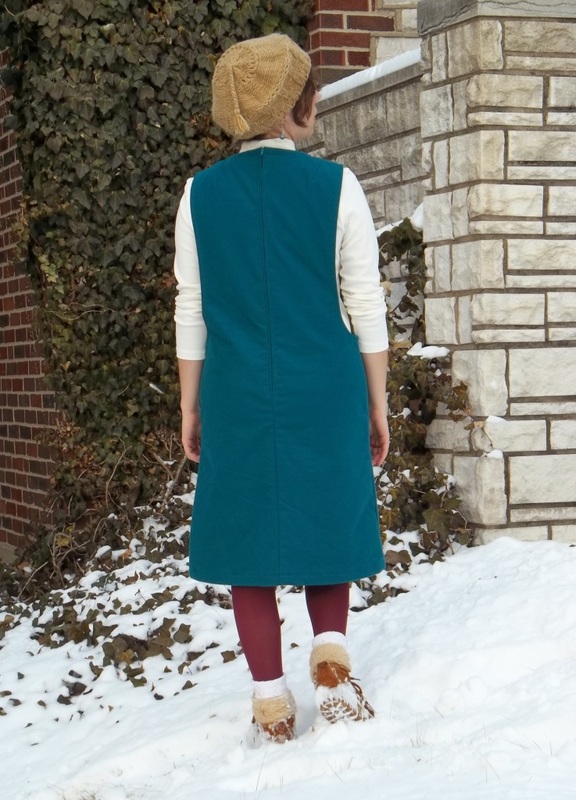 The Hollywood pattern I used for my skirt is my second unprinted pattern to use. The white blouse I’m wearing in my pictures is the first unprinted pattern I’ve done. I’m really liking unprinted patterns…or at least getting used to them. I had to be quite careful to label which pattern piece was which, since the pattern has four skirt panel pieces (eight fabric pieces). All those panels actually helped me match up the plaid, as well, since I got to use all the balance marks to align the lines properly. The pattern also really impressed me with beautiful shaping and curves built into the pattern pieces around the hips and waist, especially around the side seams and…ahem…the behind. I don’t see such beautiful details in modern patterns too often. I had to grade up because my pattern size was too small. The total amount I needed to add was four inches, but, breaking it down between the four skirt panels makes it much less intimidating. 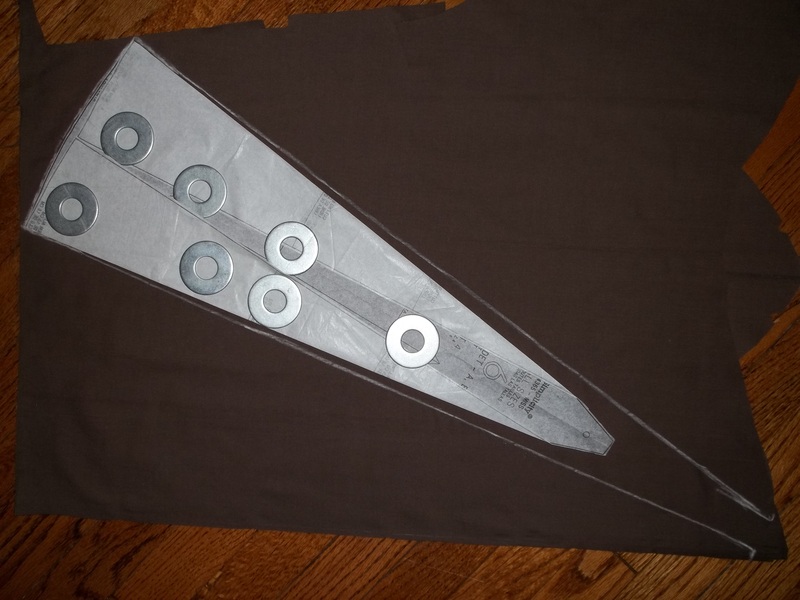 A scant 1/4 inch was added to both sides of each skirt panel pattern piece to add up to a total of four extra inches. This wasn’t a big deal until I had to adjust the waistband. 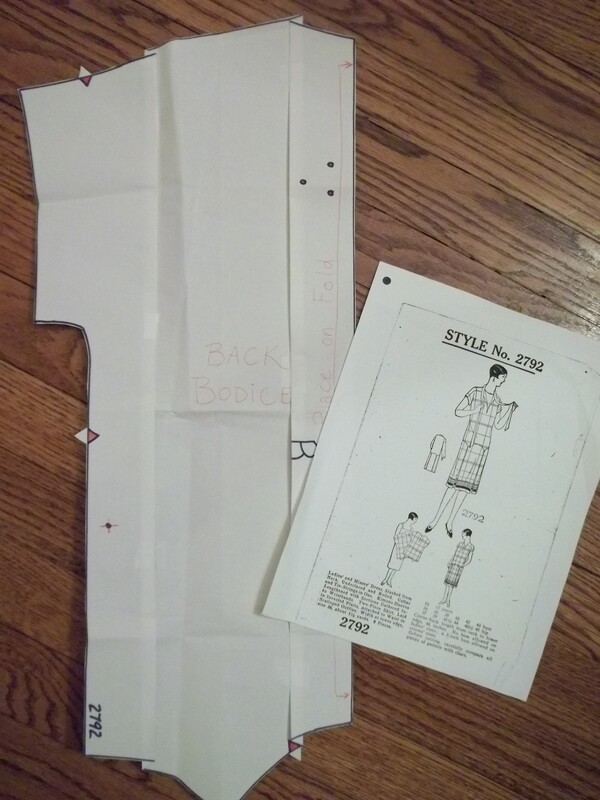 I made a paper copy of the original pattern piece for the skirt then worked on grading up the copy. I marked the front center, back center, side seam, and the rest of the spots where the skirt panel seams meet at the waistband. Then I split the skirt waistband at each of those places where I marked so I could spread it open in intervals of 1/2 inch. 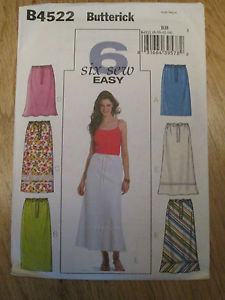 For some reason, adding only 1/2 inch to the waistband where each skirt panel comes up did not get the tabs to match up. Only when I added 3/4 inch at the center front, center back and side seam did the waistband match the skirt. You can see my grading work to the waistband in the picture below at left. Lightweight interfacing had been ironed on to the back of the waistband pieces, even though the instructions made no mention of doing this. I am so glad I did that step, because it helps the waistband keep its unique shape instead of wrinkling up. After trying on the skirt before adding the waistband facing, I unexpectedly realized I needed to further adjust the fit for the curved panel to succeed. I added a tiny 1/2 inch dart to the waistband side seam, while the each of the two waistband tabs at the zipper opening had 1/4 inch darts added right where the zipper meets. The darts brought the waistband in slightly, shaping it to a woman’s curves, otherwise it would have stuck out stiffly like an ill-fitting corset. Two inches were cut off the bottom of the hem to bring it to a good length at my legs and make it even with the hem of the lining. A longer length seemed to make the skirt appearance a bit more dowdy. 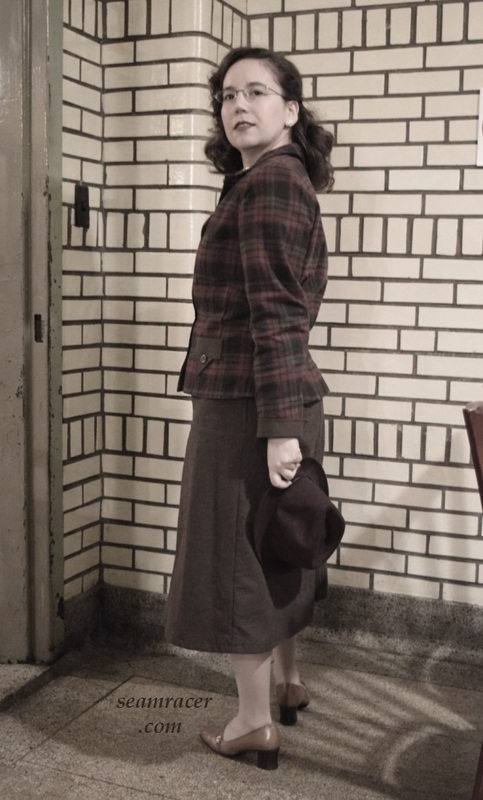 Besides, the shorter, below-knee, mid-calf length I chose would have been just right for the activities appropriate for a 40s woman wearing a skirt like this: gardening, biking, shopping, and the like needed to be done while still looking feminine. 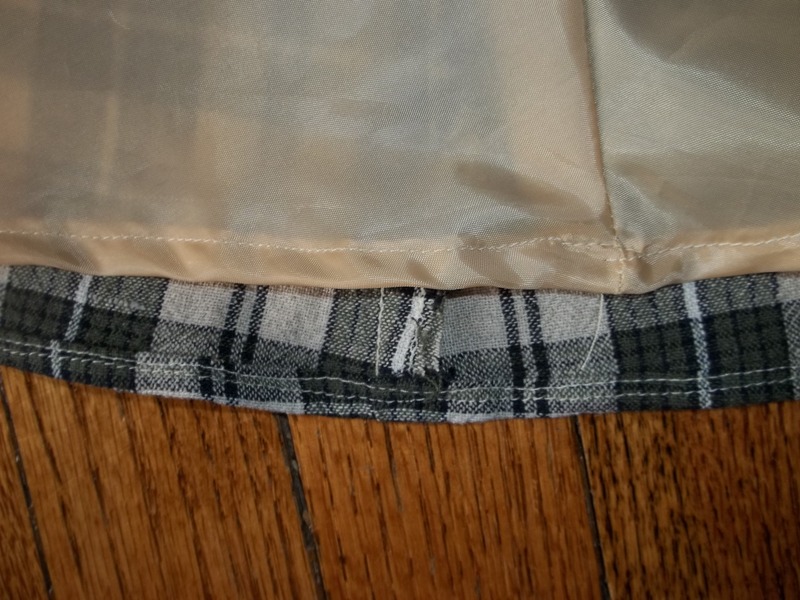 I sewed a small 1/4 inch hem on my skirt, which brought it even with the lining hem by about a 1 inch difference in between the two (see above picture). 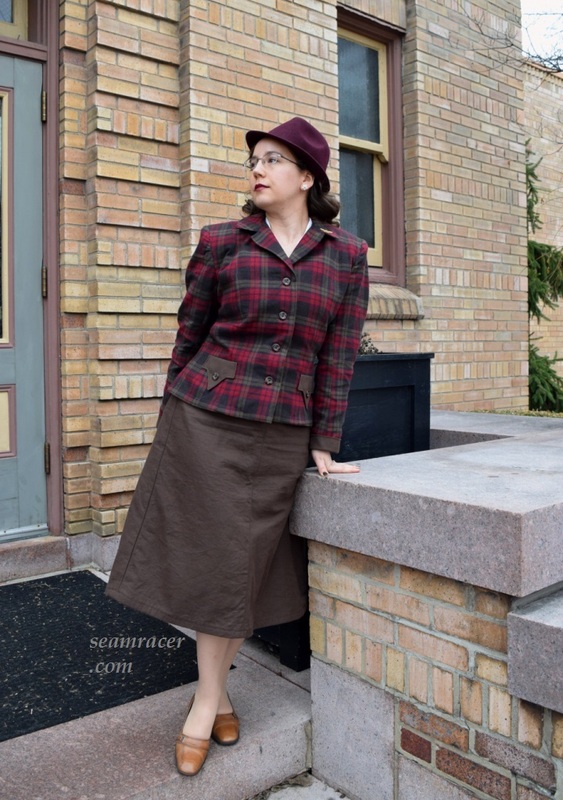 Throughout the entire construction process of my 1943 plaid skirt, I was very skeptical as to whether or not I would hate, love, or merely tolerate the finished garment. About 90% of the time I was generally on the ‘hate’ or even ‘merely tolerating’ side of emotions. However, as usual for many garments I’m skeptical towards, once my skirt was done and m atched up with shoes, belt, blouse, and even the right hairstyle, I could smile and honestly say I really love it! 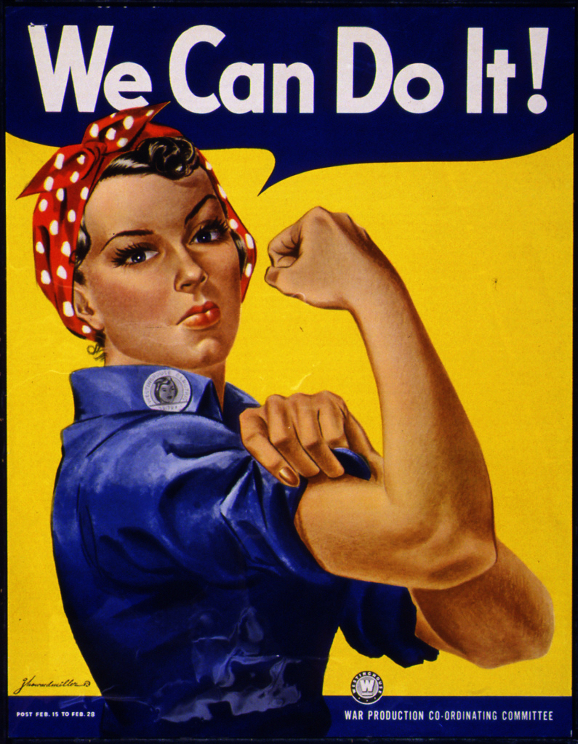 Wearing my “workday” outfit put me in the mood to do my very own “Rosie the Riveter” poster imitation. I even turned our picture into black and grey tones to get an even better 40s feel to it. Look at my muscle! 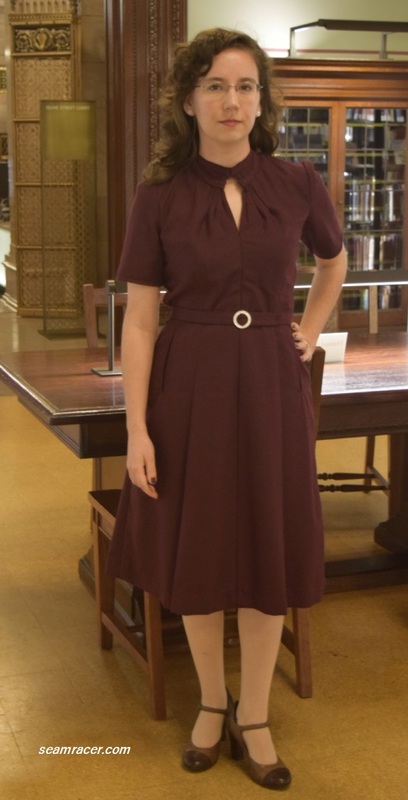 I am planning to build upon my 1943 skirt, adding to the aim of it being the foundation of a wartime wardrobe of easy separates. 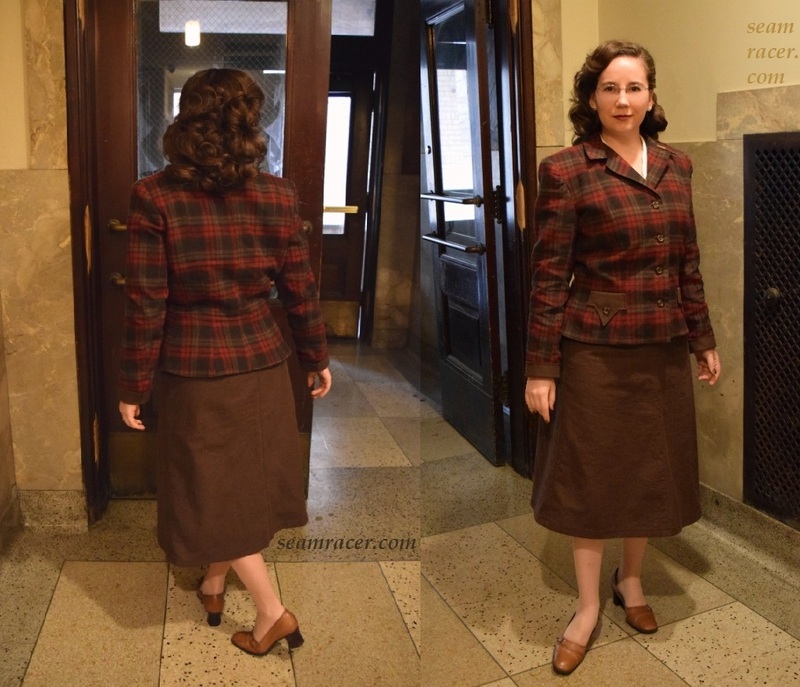 Thi s coming Fall season, maybe early September, I would like to use another vintage pattern I own – a year 1941 Simplicity 3961, in the right picture – to sew up a suit jacket or suit style top to wear with this plaid skirt. 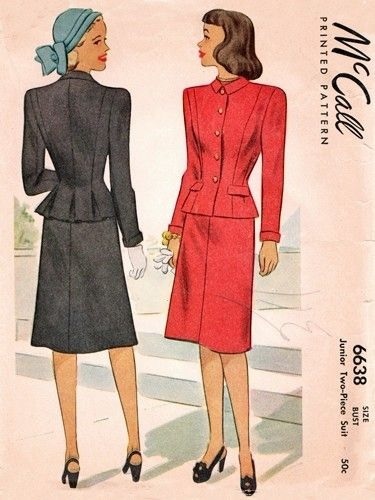 I have a nice rayon gabardine or linen in mind for the fabric, and either an ivory, a brown, or an olive green for the color of the suit jacket or top from Simplicity 3961. I think a suiting separate will easily take my “workday plaid” into a higher “Sunday-worthy” sort of classiness. The versatility of my new skirt is endless!